The Winnacunnet High girls basketball team just keeps on rolling, and we continue to see a sizable gap between the top 2 teams in Division I and everybody else. Nashua North is a good team. They were 10-4 coming into this one, and in their last game they scored 31 points in the 4th quarter, coming back from down 15 to beat a good Dover team. North has good quickness, led by the Choate sisters (Summer and Taylor) who are as quick and athletic a duo as there is in NH. They have some good rebounders, led by Emily Boots (who had 14 rebounds in tonight's game) and some good shooters led by Katelyn Roeser (who hit 4 threes tonight). And while North was able to hang right there with Winnacunnet for most of the 1st half, Winnacunnet was clearly the better team and for the entire 2nd half the outcome of this game was never really in doubt. 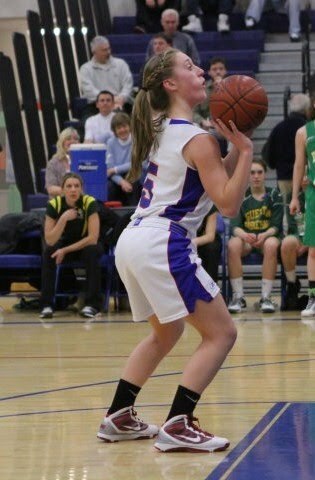 Led by stifling pressure defense which forced 16 North turnovers trough 3 quarters, and strong ball movement on offense which resulted in 17 points for Anna Sullivan, 16 for Carly Gould, 13 for Kirsten O'Neil and 7 for Aviana Morrison, Winnacunnet cruised to a 64-45 victory on Tuesday night in Nashua. "We average 12 turnovers a game" said Nashua North head coach Ricky Oliver. "So tonight was disappointing. We also missed too many layups." It was only 7-6 Winnacunnet at the end of the 1st quarter. Neither team could seem to hit any shots. They were getting decent looks but they just weren't falling early on. Also both teams were feeling each other out in the beginning of the game, both teams seeing what kind of defense and offense the other would be in, and there seemed to be some nerves early on both sides. The defenses were simply playing better than the offenses, and as a result points were very hard to come by early. That all changed very quickly, though. As soon as the 2nd quarter began, the scoring picked up. Winnacunnet exploded for 23 points in the 2nd quarter, followed by another 20 in the 3rd. Early in the 2nd period though North was right in the game and they weren't backing down one bit. After a put-back by forward Eden Tomaszewski the Titans took a 12-11 lead. Winnacunnet came right back though, as sophomore forward Melissa MacLeod answered with a shot from in close. The up-tempo basketball continued, and just seconds later Taylor Choate (8 points) hit a layup to put North back on top 14-13. Unfortunately for the Titans that would be their last lead of the game. The Warriors then went on an 8-0 run, including a three-pointer by O'Neil and a three-point play by Sullivan. That gave Winnacunnet a 21-14 lead with 3:00 left in the 1st half. North battled back though, and after Roeser (12 points) drilled her first three of the game the Warriors lead was right back down to 3, at 22-19. Winnacunnet then answered back with yet another run, scoring the last 6 points of the quarter to go into halftime on top 30-21. Once again it was Player of the Year candidate O'Neil who ignited the run, as she grabbed 2 steals, scored on 2 layups and also made a nice pass to Gould for a layup. "We were streaky tonight" said Winnacunnet head coach Ed Beattie, who hopes to win his 6th D-I (Class L) championship in a row this season. "We played well in spurts. They're a good team though, they have 10 wins for a reason." The Warriors kept the momentum going to start the 2nd half. O'Neil made another nice dish to Gould for a layup, then Sullivan was able to break free inside off a flex cut for a layup, making it 42-27 Winnacunnet with 3:00 left in the 3rd quarter. North continued to hang around though, and they refused to give up. Roeser and Brittany Morton both hit three-pointers, and the Titans closed to within 11 of Winnacunnet at 46-35. "They're an easy team to prepare for" said Coach Oliver. "He's run the same stuff over there since the 90's. We know they don't like to be pressed, so we pressed them the whole game." But after that Winnacunnet was once again able to answer back, as Morrison and Sullivan converted layups at the end of the quarter, as the Warriors led 50-35 heading to the 4th. Winnacunnet then made it an 8-0 run following a nice dish from Sullivan to O'Neil on a nicely executed 2-on-1 break. That made it 54-35 Warriors, giving them their largest lead of the game. It was then when you really knew that the outcome of the game had been decided. Thew lead was too big for North to come back from, and Winnacunnet started to take their starters out. But give credit to North because rather than hanging their heads they just kept on fighting. Roeser hit 2 more threes, and then Genevieve Gosselin made a nifty move to the basket and finish to once again cut the Warriors lead to 11, and it was 56-45 Winnacunnet with 3:32 left in the 4th quarter. In addition to Roeser's hot shooting and Gosselin and the Choate sisters pushing the tempo, Boots continued to do greta job of rebounding the basketball. "She's a beast" said Oliver, whose team is now 10-5 on the season. "She's our queen of the boards. Boots is only about 50 rebounds away from 1,000 rebounds for her career." North made it interesting near the end to creep within 11, but then Winnacunnet ended the game on an 8-0 to account for the 64-45 final score. This is a VERY tough week for Nashua North. They had to play Winnacunnet tonight, and on Friday they have to play against Bishop Guertin, who is 14-0 on the season. That's right, the Titans have to play the 2 best teams in the state in the span of just 4 days! On the bright side they do play both games at home. As for Winnacunnet they will try to not look past their game on Friday vs. Dover. Although Dover is a good team, it is clearly BG and Winnacunnnet at the top of D-I followed by everyone else and next Tuesday night those 2 teams will do battle in Hampton. The first game between the Cardinals and Warriors was THE best girls basketball game of the season so far, and the game next Tuesday promises to be just as good if not better. Londonderry is the third best team in D-I but they lost by 15+ points to both BG and Winnacunnet, meaning there is definitely a gap between the top 2 teams and the rest of the pack.